Not fond of having to wait (and wait, and wait) while you download Windows updates from Microsoft's servers? 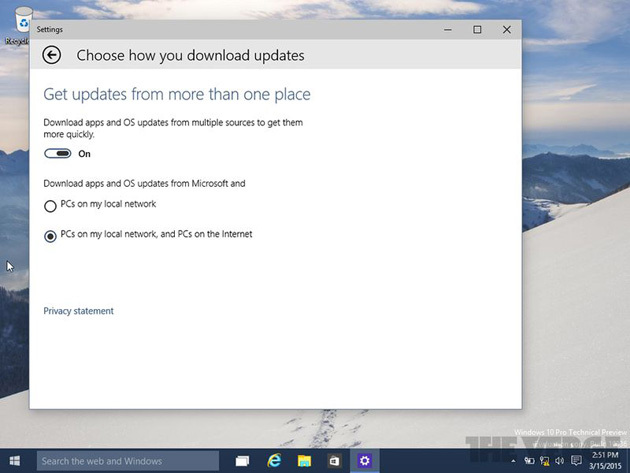 You might not have to when Windows 10 arrives. The Verge has noticed that a leaked version of the operating system lets you grab updates from other computers, whether they're on your local network or online -- yes, it's a peer-to-peer network for patches. Besides accelerating the upgrade process, the option could save precious bandwidth (important on capped data plans) if you have a multi-PC household. There's no telling when this feature will show up in a Windows 10 build you can try, assuming Microsoft doesn't get cold feet. A new public test release is reportedly coming soon, though, so you probably won't have to wait very long.